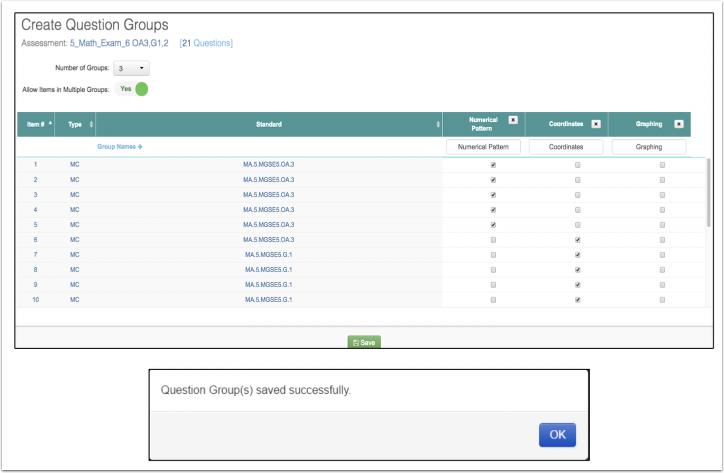 Question Groups allow users to group test items/questions together for reporting purposes. Question Groups can be created for assessments that are published, in progress, or closed. Once students complete the assessment, the Question Group report can be reviewed in the Report Manager. Please see the Help document,Basic Navigation: Navigating the Launchpad 6.0, for more information. Note: Question Groups may be created for assessments that are Published, In Progress, or Closed. Number of Groups: Determine the number of groups you wish to create. Allow Items in Multiple Groups: Select “Yes” to allow an item to reside in multiple groups; select “No” to allow an item to reside in only in one group. Group Names: Give each group a name. Select Items: Check the box to place an item in a group. Click on Save to save your groups. A message will appear verifying this action. Click OK to continue. After students have completed the assessment, the Question Group Report will automatically generate and will be available for review. From the Navigation Grid, select Reports. The default setting shows the list of Predefined Reports under the orange tab. Click on the Question Groups name in blue or on the view icon (eye) to the far right to go to the report. Note the descriptor statement for this report. Or, from the Launchpad, click on the REPORTS Flip Card. On the flipped side, select Predefined Reports, then Question Groups. Search Filters: Types of search filters depend on user role. Click Refresh to view results. Full Screen: View the report in full screen mode. Download icon: Export report to PDF, Excel, or CSV format. Student Search Box: To view results for a specific student, enter the student’s first or last name, then click on the magnifying glass icon. Student Results: ID #, Name, Grade, Raw Score, Overall Raw Score (RS) and % Correct, Question Group Raw Score (RS) and % Correct (blue bar). Class average in black type.